Burning an ISO to a disc is easy and is a feature that is built into Windows 7 and later versions of Windows, In this article I will show you how to burn an ISO to a Disc using the built in Windows Disc Image Burner. 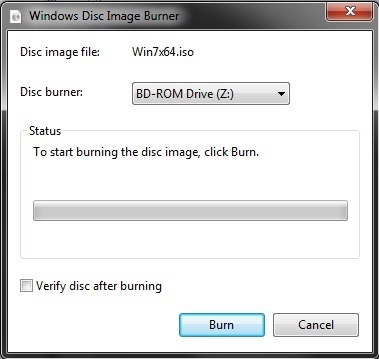 Using Windows Disc Image Burner is so simple, all you have to do is right click on the .iso fie you want to burn and click "Burn Disc Image"
A window will then come up allowing you to select a disc drive and burn the image to disc. If you are on an older version of windows that does not have Windows Disc Image Burner then you can install some third party software to allow you to do this, there are many options to choose from but the one I will use for this tutorial is ImgBurn. Download and install the ImgBurn software from the ImgBurn Website at http://www.imgburn.com/ and make sure when you install it to uncheck the ask toolbar option, this is an extra accessory that you do not want nor need. Once the software is installed and ready to use burning an iso uses a similar process to the Windows Disc Image Burner, just right click on the ISO file and click Burn using ImgBurn. A screen will be displayed allowing you to choose which drive to burn to and then burn the image to disc.